An aromatic, tangy, unique pulao with a pickle taste. The rice is seasoned with pickling spices like mustard seeds, fenugreek seeds, fennel seeds and onion seeds for an achari flavour. No pickle paste is added to this dish. A dash of lemon juice adds zing and brings this dish to life. Dried chickpeas are soaked overnight, pressure cooked and then mixed in with the spices and rice. The addition of chickpeas is a healthy option providing protein and fiber. This pulao is a meal in itself. With its achari flavour, you do not need any pickle at the side. It can be served with raita and papad. 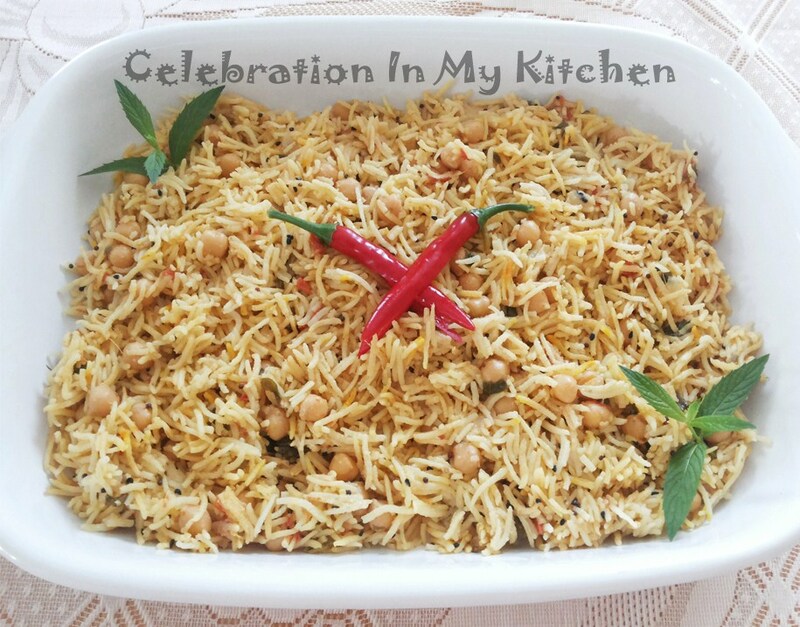 A nutritious, healthy, delightful rice dish which will be a hit at family dinners or parties. Chickpeas or garbanzo beans are rich in vitamins, minerals, protein and dietary fiber. They are low in fat and are good for controlling weight. Also, with a low glycemic index, they are ideal for diabetics. Helps reduce bad cholesterol levels. For a healthy colon, consume foods that are rich in fiber like chickpeas. Wash and soak dried chickpeas overnight. Pressure cook with salt and water (indicated in the list of ingredients), around two whistles. Place hot cooker under a tap of running water and release steam, remove weight, open lid. Ensure that the chickpeas are cooked. Do not turn them to a mush. Reserve the liquid for pulao. In a wide bottomed pan, heat oil, add mustard seeds, onion seeds, fennel seeds and methi seeds. When the seeds splutter, add onion and green chillies. Fry till onion is translucent and then add ginger, garlic followed by tomato. Add turmeric powder, chilli powder, pinch of saffron, yogurt and the bouillon cubes. Ensure to crush the cubes and dissolve with the onion tomato spice mixture. Pour 3 1/2 cups of the reserved liquid into the pan. Cover pan and let it come to a boil. Drain rice and keep it ready. When the stock comes to a roaring boil, stir in the rice and chickpeas gently. Cover pan with the lid and on medium heat, let the rice cook for 3 to 4 minutes. When half the stock is absorbed, stir in the lemon juice, mint and coriander leaves. Check for seasoning and add salt. Put the lid back on and let the rice continue to cook. After few minutes, you will see holes in the rice with little liquid left at the bottom of the pan. At this time, shut off the flame and close the lid. Do not touch or open for 15 minutes. The rice will absorb the remaining moisture. Lift the cover after the indicated time. Each grain of rice will be firm, cooked and separated. With a fork, gently move the top grains around to moisten them. The rice to water ratio for every 1 cup of rice is 2 cups of water. I always add 1/2 cup less water or stock. The reason being that the rice is soaked for 30 minutes so it does not require the extra 1/2 cup. India Gate classic basmati rice was used for making this pulao. The grains are quite long and fragrant. Always use a wide bottomed pan to cook pulao. This gives the rice grains enough room to spread and bloom.